Renewed version of successful sports glove. Innovative multi‐panel construction incorporating strong and supple leather main chassis. Palm and outer edge of hand reinforced with Clarino® suede for abrasion resistance and support. Poly-foam padding on fingers, thumb and wrist for improved fit and additional impact protection. Lightweight, durable carbon fiber knuckle guards offer superb protection against repeated impact. TPU palm slider for excellent abrasion resistance and protection in critical impact area. Large air exhaust vent on back of hand features TPR ridge for additional abrasion resistance. 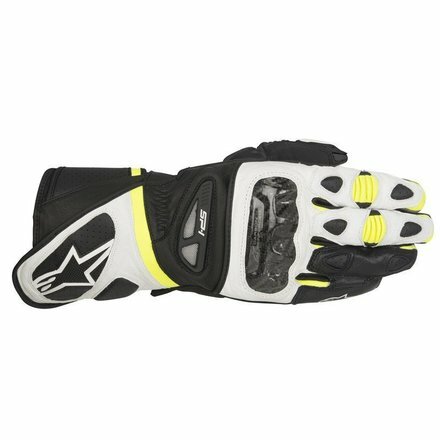 Alpinestars’ patented third and fourth finger bridge prevents finger separation and limits finger contortion and burst seams. Leather accordion flex inserts on fingers and thumb provides support, fit and comfort. Thumb, fingers, palm, top of hand and wrist are padded with 4mm perforated poly‐foam for extra cushioning and comfort. Gauntlet‐style cuff includes an elasticated wrist and a double Velcro® closure for a secure customized fit. Anatomical, pre‐curved finger construction helps prevent fatigue and improve riding comfort. Leather reinforcements cover fingers and sidewalls for durability. Touchscreen compatible index fingertip for ease of use with smartphone and GPS.